So what did you grill today? 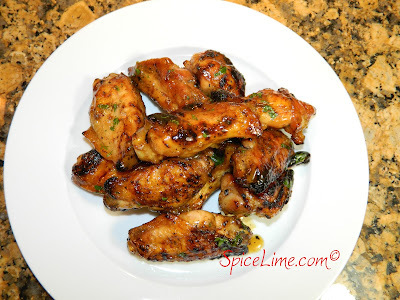 Here's my favorite grilled wings recipe. These sweet and spicy wings have a sticky fruit glaze, red pepper and fresh cilantro. You can sub the pineapple-orange-banana juice for any flavor you like, like pineapple-orange or even plain pineapple juice. Add these to your BBQ or grilled menu and your family will love them. Off to watch some fireworks at the beach tonight! Happy Independence Day! Season chicken wings with lime juice, garlic, ginger, salt and black pepper. In a medium pot, combine pineapple-orange-banana juice, brown sugar, soy sauce and red pepper. Stir well. Let simmer and reduce over medium heat for 30 minutes, stirring occasionally. While glaze is simmering: Place seasoned chicken on grill and cover. Grill wings, turning occasionally, until wings are nicely browned and cooked through, about 30 - 35 minutes. In a small bowl, mix cornstarch and cold water to make a slurry. Add to glaze in the pot. Stir to thicken for 5 minutes. Remove from heat. In a large bowl, pour glaze over grilled wings. Add cilantro and toss well to coat. Serves 4-6...I guess it depends on how much you love wings! Note - If you prefer spicier wings, use 1 tsp crushed red pepper.